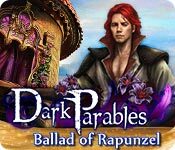 Dark Parables: Ballad of Rapunzel is rated 3.7 out of 5 by 29. Rated 5 out of 5 by JulzCat from One Of The Best Dark Parables Yet! I was surprised by the low reviews...this is one of my favorites of the series! For starters, this game was much longer than the last. If you've played all of them up until now, you'll get to see the return of 2 children from a past game and one person you helped in the past will return the favor and help you! This is not your typical Rapunzel story. As usual, Dark Parables creators will throw in other characters from other fairy tales (giving it that "Once Upon A Time" feel). 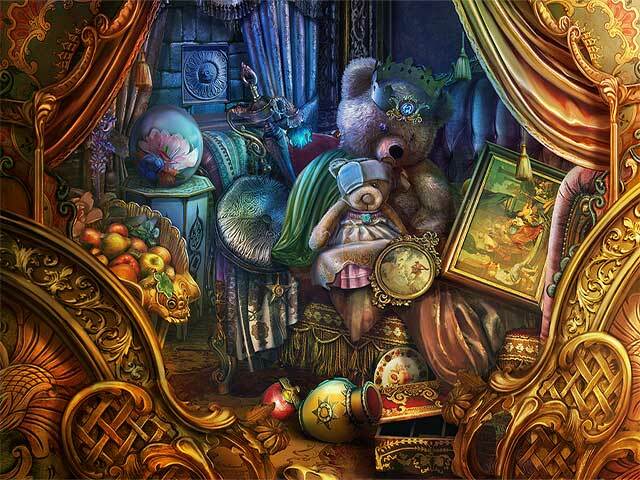 This game has the usual fragmented hidden object scenes, fun mini-games and pieces of story you can collect along the way. The best part was the 20 flower stones you can collect to get the happiest ending...you have a choice of 3 different endings! Rated 5 out of 5 by SparkleGlow100 from Rich, vibrant, decadent ornaments throughout **15 HOPS** Available at BFG since 2014. Summery loveliness. Bitter-Sweet story, like all the best, early Dark Parables. Fragmented HOPS, all surrounding jewels and ornaments. Whatever you make, whether it's a medallion or a plaque, will be of the most beautiful, exquisite, over-the-top design you can imagine. Satisfies that part of the brain that nothing else can (except for collections of pretty desserts). Give this game 30 mins and you will start to get this feel of how this game will continue. In the past I had quit playing several times in the trial. This was due to the guy who obviously needs help breathing in the heavy, pollen-laden atmosphere! My way around this problem was to mute the sound until that bit was over! Also, I think they tried to make this game too long! At the very end there's a stretch in the library, where I felt like I was never going to get out. It seemed to go on and on and on. And, since this is a game about flowers and ornaments and so forth, it seemed completely out of sync to be in library! Everything else was good! GRAPHICS - Widescreen, but I played it in the original format to keep the graphics looking bright and tight. HOPS - 15 HOPS PUZZLES: All skippable SOUNDS - Music tied to ambiance, meant I often played in silence except for thuds and trills related to my mouse-actions. MAP: NOT TRAVEL JOURNAL: NONE DIFFICULTY SETTINGS - 3, interchangeable at options HINT: Guides and leads you. 20 seconds to recharge on Casual, 45 on Normal and no hints on Expert. INVENTORY - Visible at all times CHARACTERS: Interesting. Not too much interaction. Mainly you're on your own. My fav Dark Parable games are as follows: The Exiled Prince, The Last Cinderella, Briar Rose, The Little Mermaid and the Purple Tide, Jack & the Sky Kingdom & Ballad of Rapunzel. Rated 5 out of 5 by JenSolley from One of my favorite Dark Parables games!! I LOVE the Dark Parables Series!! This game is one of my favorites!! I might even play it again!!! I love that at the end you get to choose only one of three items that will effect the outcome. That is why I want to play it over again to see how an alternate choice will alter the ending!! This game has the "cursed" objects, you know the morphing objects that you can find throughout the game!! I love searching for those!! The graphics were amazing!! Every time I unlocked a new scene it was so exciting!! The game ran well on my computer and I did not have any problems. Rated 5 out of 5 by RevKellie from Moving Right Along Beautiful and brilliant entry in the Dark Parables Series. I love being the Fairy Tale Detective. 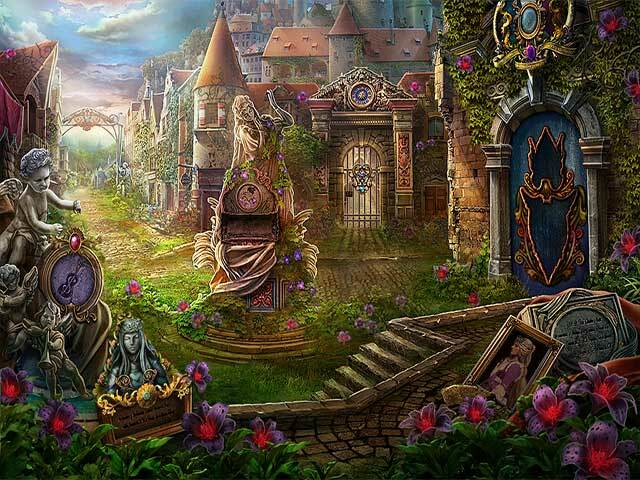 This puts the spin on the story of Rapunzel and uses a lot of floral imagery that makes it deep and interesting. Pros: Beautiful graphics/sound, Smooth intuitive game play, interesting story and characters, Games Medium-Med-Hard. Cons: I don't like the "Put it together" HOS scenes (which really aren't HOS), The map tells you where you need to be, but doesn't take you there - the movement is a bit confusing (what looks like a left turn on the map is really a back button click). Minor flaws in a majorly fun game. A lot of the art in this was the same - so after a bit it started to bore. Variety of colors/artifacts would help. Rated 5 out of 5 by Weenie123 from Glad I didn't listen I enjoyed this game just as much as the others in the series. I especially liked the three seperate endings to choose from. Played all three just to see!!! Rated 5 out of 5 by haney57 from Dark parables: Ballad of Rapunzel this is great love doing stories that my mom used to read to me. the item's where easy enough to find even a beginner could handle casual mode. But for me i must jump up a notch as seamed to easy ,I'm not a beginner. Rated 5 out of 5 by MisterBear from Colorful and Fun I'm really, really tired of games where the screens are all dark, the atmosphere dank, and you find yourself pawing through rotten ick searching for various needed items. So I enjoyed the bright flowers, colorful jewels, and occasional butterfly. There were some new takes on puzzles, which I always appreciate. The story line was in keeping with the rest of the Dark Parables and I enjoyed the way the game linked in stories and themes from prior games without making it mandatory that you'd played them. The game length was excellent. Rated 5 out of 5 by grammakk from fishies let down your hair this was a glorious game..not a toughy one and though i'm not fond of hos that are find the pieces it did not get under my skin they were not that difficult. the story-line was soo interesting if you take the time to read all the history involved with the other princesses and the way they got the way they are,it was very well done .there is a lot of to and fro in the ending part but i think that adds to the quest. you get a bit heart-pounding knowing you're going to do away with the evil SOON. very long ,enjoyable, colorful not foo foo characters..sad ending i think...not what i expected...a plus. Rated 5 out of 5 by pennmom36 from Rapunzel Has Gotten Herself Into A Hairy Situation! In true Dark Parables style, the Ballad of Rapunzel has come to life with just enough of a twist to turn a classic fairy tale into an epic game! Just who is the evil woman beside the once beloved Princess Rapunzel, is she somehow responsible for causing flowers in the kingdom of Floralia to emit a deadly poisonous pollen that disables it's victim. This stranger has been beside her the entire time urging her to sing a beautiful melodic song, "sing for me Rapunzel" Who is this wicked woman? It's time to let your hair down and roll up your sleeves, because there's a Dark Parables mystery to solve! I loved how they tied this game in with Snow Queen, as soon as I heard the name Kai, I knew the characters were the grown up children captured by the evil Snow Queen (and rescued by you, detective!) Everything is unique in this adventure. The graphics are beautiful, Dark Parables has a flair for enchanting designs and the entire game revolves around finding Emblems that unlock the magic within. I've yet to play any of these DP that wasn't superior entertainment. 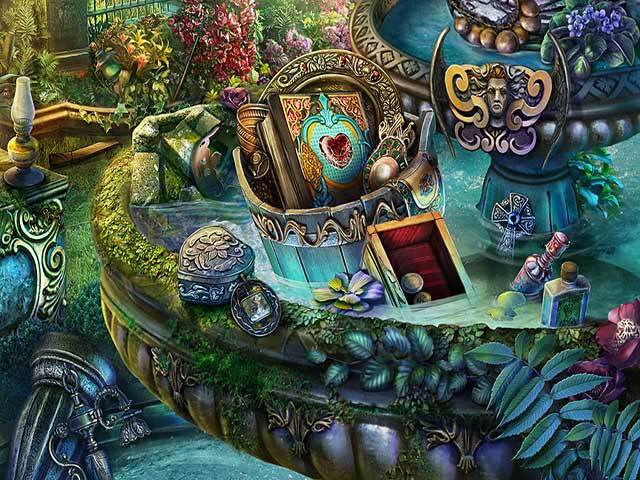 The Hidden Object Scenes are actually well blended FROGS. This is where you must find fragmented pieces in three sections and when you find all three sections, the sections will form together to make a single inventory item. Most of the mini games involve interacting with a stage scene, for example the first part of a mini game has you select tokens with different stages of a flowers growth in order, from seed to a dying flower. The second part will open and there are three separate puzzles, one with tokens that you rotate to complete a picture, another has you swap tiles to complete a picture and the final puzzle has you guiding tokens on a path until the correct token is in the correct spot with the clues shown. Personally, I would choose the CE because of the 20 morphing objects,(My favorite feature), morphing objects won't necessarily be activated when you first see them, some objects won't morph until a specific action or chapter has been accessed so you may have to backtrack several times before an object morphs. Each time you find a morphing object it will make your hint meter recharge faster as well. Once again you will collect Parables, there are several parable stories and each story requires you to find all parables in a category before you can hear that tale. The Collectors Edition has 20 collectible stone flowers, roses, magnolias, cosmos, tulips etc. There are also puzzles, wallpapers, movie gallery, music, concept art, parable notes, morphs, a built in strategy guide and a bonus chapter. Consider upgrading to the CE, but either edition will surely please, enjoy! Rated 5 out of 5 by biscuitsmama from Beautiful but Predictable When I was little I always looked forward to bedtime when my grandmother would read fairy tales to me as I was falling asleep. The story of Rapunzel, locked in a tower and letting her locks down so that she could meet with her prince, was always one of my favorite tales. As usual Blue Tea has given us their darker spin on a beloved story and now it is a great new game in the Dark Parables series. Because this is a Blue Tea game, the graphics are beautiful and of excellent quality. The music has the haunting quality that is found in all of the games in the series but that doesn’t matter since I happen to like it and find that it adds to the game. In the Dark Parables games we don’t really have a journal but you can locate your objectives or current tasks. The map does show where we have something to do and others have commented (in other games in the series) that the maps are transporter type but I have never found that to be true, so either they don’t work on my laptop or they really are not transporter type maps to begin with. At least the map does clearly show where something is to be found or done. The Dark Parables games are FROG type so the HOS are for locating portions of symbols, medallions or other objects. Although I am not a huge fan of FROGs in general, I do love the ones in games from this developer because the fragments or items to find are always hidden in beautiful scenes. There are puzzles to be found in the game and, IMHO, some of them took a bit of thought and were not overly easy to complete. There is much about this game in the beginning that is reminiscent of others in the series. I don’t know if it is because the music is the same but I definitely notice the slight remake of scenery to fit the current game. The one sad thing is that the Dark Parables games have become very predictable and each one is much the same as the others even though the characters and story may be a bit different. As much as I like the FROGs from this developer, I would like to see them branch out and use their skills to develop a different type of game. That being said, I will add this beautiful game to my collection. Because of the quality of the game and because people who are new to playing the Dark Parables series will most likely love the game, I am giving it the five-star rating it deserves. As always, I recommend that you at least try the demo to see if this is a game you will like.